Guild F-20 Model Flat Top Acoustic Guitar (1968), made in Hoboken, NJ, serial # AG-2633, sunburst top, dark back and sides finish, mahogany back, sides and neck; spruce top, rosewood fingerboard, original black chipboard case. The often extremely fine-sounding Guild flat-tops of the 1960s were popular at the time but can be surprisingly hard to find these days; examples this nice are far from common! 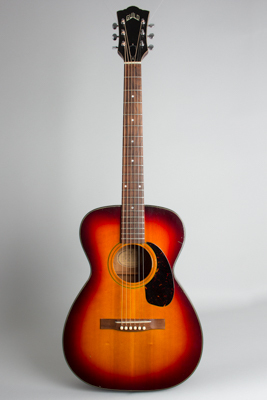 This is a mid-1968 sunburst-top F-20, the smallest body size in the company's line up. The F-20 was the next model up from the all mahogany M-20 (famously regarded as the "Nick Drake" guitar) and is the same size and shape but with a spruce top instead of all-mahogany construction. This is very a smooth little finger-or-flatpicking guitar, with a vibrant midrangey sound that also works well as a strummed chord machine. The fairly dark reddish-orange sunburst top seen on this guitar was the standard finish option but seems less often encountered than a plain natural top. This is an extremely well-built little guitar, much lighter in construction than 1970s Westerly Guilds and easily a match in sound for similar Martin offerings from the same era. This is a fine recording or gigging guitar, a nice example of one of the best small body flat-tops of the 1960s. Overall length is 39 in. (99.1 cm. ), 13 3/4 in. (34.9 cm.) wide at lower bout, and 4 1/16 in. (10.3 cm.) in depth at side, taken at the end block. Scale length is 24 1/2 in. (622 mm.). Width of nut is 1 5/8 in. (41 mm.). This is a very nice clean example overall, all original with some light play wear but no major finish loss. There are small dings and scrapes to the finish overall. The sound hole lip has some finish worn away, and there are a couple of deeper pick scrapes on the edge of the upper treble bout and some small spots through the finish on the back. There are no apparent cracks anywhere. This guitar has had a very cleanly done neck set with some light overspray to the heel, set to the original full-height uncut bridge. There is a newer strap button added to the heel. Overall this is a very nice playing and sounding old Guild, with a strong upper-mid character to the tone. Includes the original chipboard case with some internal personalization. Overall Excellent Condition.